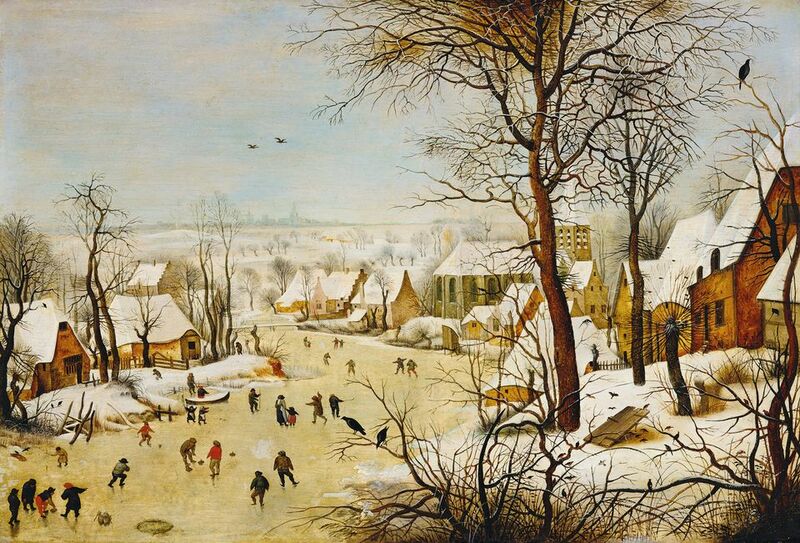 Pieter Bruegel the Elder’s Winter Landscape with Ice-skaters and Bird-trap (1565), frequently reproduced by the family workshop and others. Courtesy of the Royal Museums of the Fine Arts, Brussels. The monographic exhibition on Pieter Bruegel at the Kunsthistorisches Museum (KHM) in Vienna that closed earlier this year had an unprecedented number of visitors—more than 400,000—and will remain without comparison or repetition for a long time. The exhibition showed 27 of Bruegel’s nearly 40 known paintings, together with drawings and prints on the occasion of the 450th anniversary of the artist’s death. But Bruegel’s fame has been unbroken for centuries and his strong images are omnipresent even today, especially on the internet, which heightens the interest in seeing the originals. The attraction of the encounter was heightened by the exhibition’s promise to reveal the secrets of the works through technical studies: not only were the originals presented, but also the results of a research project begun in 2012. Within this framework, the KHM’s 12 panel paintings were examined, through a programme sponsored by the Getty Foundation. The main focus was on a deeper understanding of the panel construction, the painting technique and the history of the materials, there was also a focus on the “art-historical processing and provenance of the works”. The technological investigation made use of the entire repertoire of non-destructive examination methods currently in use. X-rays were taken, infrared reflectography and infrared photography were deployed to make the underdrawings visible under the paint layer, and X-ray fluorescence analysis was used to determine the pigments. To accurately measure and spatially represent the paintings, 3-D mappings were made. In addition, the wooden supports and their compositions were carefully examined. The exhibition will be remembered as a great but ephemeral experience, with the results of the technological investigation keeping scholars busy for years to come. An essential part of the research results, the glimpses below the surface of the paintings realised with imaging techniques are present on the internet. At insidebruegel.net, for which Elke Oberthaler and Ron Spronk are responsible, the macro photos, infrared images and X-ray images of the 12 paintings examined are available free of charge. This largesse cannot be praised enough, as it provides all scholars with invaluable material for a deeper understanding of the workshop practice of Pieter Bruegel the Elder. One of the most important results of the Viennese research project is the observation that there are different forms of preliminary drawing under the painting layer. The 2001-02 exhibition De Firma Brueghel in Maastricht and Brussels dealt with those paintings that Bruegel’s eldest son, Pieter the Younger (1564/65-1637/38), created after the popular compositions of his father. The studies by Rebecca Duckwitz, Dominique Allart and Christina Currie, published at the time, noted different forms of underdrawing and suggested the Brueghel workshop used segmented one-to-one cartoons. These ready-made designs had been inherited by Pieter Bruegel the Younger from his father, who had himself used them in the production of his “original” paintings. The fact that the first repetitions of Bruegel the Elder’s pictorial inventions were produced at a time when the younger Pieter could hardly hold a brush invites the conclusion that Bruegel the Elder already had a workshop from which repetitions of popular pictures emerged. But the KHM exhibition dedicated to the “Hand of the Master” avoids this conclusion. Oberthaler also assumes in her contribution that only Brueghel the Younger used the cartoons inherited from his father. The distinction between the “original” Pieter Bruegel the Elder and the copies from his son’s workshop combines the art-technological findings with a 19th-century artist’s image that has nothing to do with pre-modern workshop practice and the social reality of historical artist existence. The scientific claim is underscored by a statement by the curators: “The results of a long-term research project flow into this unique exhibition: technological analyses, the processing of art-historical research and the questioning of the traditional provenance of the panel paintings were the starting points of our project.” But the catalogue avoids focusing on the conditions of pre-modern art production. The catalogue, in fact, shows little. Aimed at the general public, it dispenses with an excess of footnotes in favour of a consumer-oriented appearance. The scientific contributions of those responsible for the project are stored in a digital publication that is freely accessible to buyers of the printed edition. Some space should have been made at least to present the complete bibliographies of the images examined by the research project. Much of what has occupied Bruegel research for decades does not appear in the catalogue, let alone the exhibition. Although the questions of interpretation and meaning of Bruegel’s pictures are not the focus of the catalogue, too much of the most recent literature on the artist has been ignored. The iconographic questions intensively studied by scholars over the past decades have been omitted, as have the investigations of the contemporary Antwerp art market needed to interpret the technological findings. When “questioning the traditional provenance of the panel paintings” is a starting point, a look at the pre-modern art market should not be ignored. The exhibition asserts a scientific claim that is not fulfilled in the catalogue. It claims to focus on the materiality of works of art, but does not question the paper Bruegel used—why and where, for example, he used the rough side of the paper for his drawings rather than the smooth side. It is difficult to do everything and there is still much to do in Bruegel studies—not least the origin of the paper documented in many cases by existing watermarks could have been mentioned in this catalogue. Does it make no difference whether Bruegel draws on Dutch, French or Italian papers during his journey? Despite this criticism, this book is beautifully designed and well printed, which makes leafing through it a pleasure.